As of February 2016, Alpha People recruitment agency will award a monthly prize to a temp who has done particularly well in their job. We have introduced this award because we believe in the importance of recognizing and thanking employees who stand out in their jobs because of their good time-keeping, attendance, flexibility and support of colleagues. Our slogan ‘Your staff are our business’ works in two ways. We, as a recruitment agency, depend on the performance of our candidates and we’re very grateful that we can offer jobs to a great number of lovely people from all walks of life. It’s time to give something back! Alpha People will present our Star Temp with a certificate and a £25 high street voucher. He/she will get a place on our ‘Temp of the Month’ board in our office, and of course there will be lots of publicity on our social media pages and on our website. 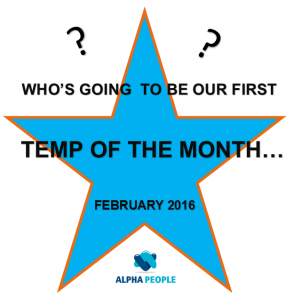 We expect to announce our first (February) Temp of the Month at the beginning of March.